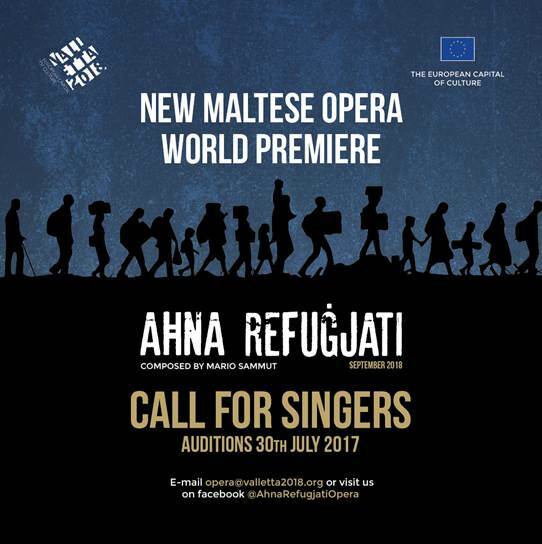 Call for Chorus Members to take part in world premiere of a new Maltese opera ‘Aħna Refuġjati’ which will take place August 31st, September 2, 4, 6th 2018 at Fosos, Floriana as one of the Special Events celebrating Valletta’s title as European Capital of Culture 2018. We are only looking for 40 singers – 10 soprano, 10 mezzo/alto, 10 tenor, 10 baritone/bass to take part in this exciting ensemble. Extensive chorus singing throughout the opera. Stage/acting experience is considered an asset. Both operatic and classical-crossover styles accepted in terms of vocal training and experience. Video applications will be accepted for those unable to attend, although live audition is preferable.